"Beer is a journey, not a destination." Schoolteacher, raconteur, and local beer advocate Bob Tupper was wearing his running shoes yesterday evening, but in the filled-to-capacity back snuggery of the Brickskeller, he had no room in which to run a 15K. Joining them last evening were more than 80 participants, raising almost $4,000 for Children's Hospital. 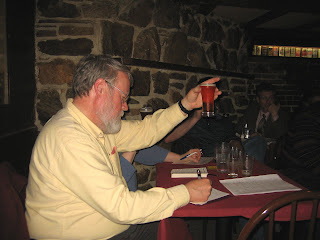 Many may know of his Bob Tupper's beers - Tupper's Hop Pocket Ale & Pils, but may not realize that few have done as much as Bob and Ellie Tupper to nourish the good beer culture of the mid-Atlantic and beyond. An uber-beer geek in the best sense of that neoligism, he truly is the godfather of good beer in our area. Wednesday evening at the Brickskeller was the culmination of a journey that Bob and Ellie had begun in 1979. Bob told us that beer #1 had been from Henri Funk Brewery in Luxembourg, now defunct. Their notes read: "Mmmm. Pretty good. Tastes like beer." Abashed but laughing, Bob assured us that their note-taking has become somewhat more detailed since then. Bob recounted several more of his and Ellie's beer tasting adventures, some quite funny in the retelling. The actual 15K beer was Stinky, an IPA from central Virginia's Starr Hill Brewery. Representing the brewery was production manager John Bryce. Beer # 15,001 was Clipper City's new spring seasonal - Holy Sheet Uber Abbey Ale. I embraced Bob and Ellie. It was a privilege to be there and honor all that they have done for good beer and for local breweries and their brewers. And I was proud that Clipper City's beer could be the first of their next 15,000! Here are the beers presented, their brewers/presenters, and the order in which they were presented. None Bob had Bob and Ellie tasted before. With virtually no space available, I was placed immediately to Bob's right. Being that close to the brewers' faces while they were presenting their beers, I avoided using flash when shooting photos. So some are blurred. It wasn't my beery condition! Really. Early on, we heard a rapping and hammering, as if Dave Alexander were building an extension to hold the overthrow crowd. But it was Bob Tupper tapping his cask of Tuppers Hop Pocket Double Dry Hopped Hop Pocket. It's best to wallop home the tap with a single blow; less trub and yeast is disturbed back into the beer. So, it astonished some of us when Bob admitted that this was his first cask tapping! The evening concluded with 1989 vintage Thomas Hardy Ale. By then my notes were, "Mmm. Very good!" Many thanks to proprietor Dave Alexander who put up with the mayhem and contributed beer as well. Sweetwater Taverns - Nick Funnell. Gordon-Biersch, D.C. - Jason Oliver. Vintage 50 - Bill Madden. Capital City Shirlington - Mike McCarthy. The worst beer they have ever tasted? Hands down, it was He Man Malt Liquor, Bob said. That is, until they sampled Bicycle Brand Fruit Flavor Beer!